Arthplus is a multicomponent medicine for the treatment of inflammations of joints and muscles, which includes a large complex of plant ingredients with anti-inflammatory and analgesic properties. This medicine is effective for the treatment of most diseases and inflammatory processes in the joints - arthritis, gout, sciatica, etc. 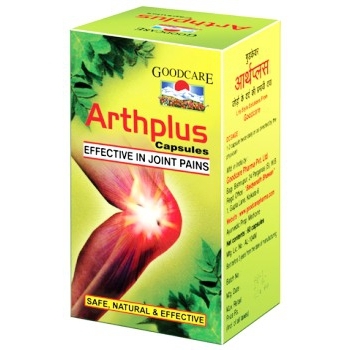 Arthplus allows in a short time from the start taking to relieve the pain and swelling in the joints, relieves inflammation and helps flush toxins from the joints. - Yogaraj guggul is the most famous in Ayurveda medicine for the treatment of arthritis, gout, rheumatism. This medicine can also be used to relieve the symptoms of premenstrual syndrome and digestive problems of Vata-type. - Singhnadi Guggul is one of the best medicine for relieving acute pain in the joints. Used in joint pain, gout, muscular pain. Indications: arthritis, gout, sciatica, lumbago, osteoarthritis. - Yogaraj guggul: Plumbago zeylanica, Piper longum, Trachyspermum ammi, Carum carvi, Embelia ribes, Apium graveolens, Cuminum cyminum, deodara Cedrus, Piper chaba, Eletaria cardamomum, Saussurea lappa, Pluchea lanceolata, Tribulus terrestris, Corriandrum sativum, Terminalia chebula, Terminalia belerica, Emblica officinalis, Cyperus rotundus, Zinziber officinale, Piper nigrum, Piper longum, Cinnamonum zeylanicum, Vetiveria zizanioides, Cinnamomum Ruthie, Commiphora mucul. - Singhnadi Guggul: Embilica officinalis, Terminalia belerica. Sudh guggul has, Commiphora mucul, Boswellia serrata, Vitex nigrundo, Trigonella foenum-graecum, Sida cordifolia, Pure Commifora mukul, Trigonella foenum-graecum. Dosage: 1-2 capsules 2 times daily after meals. Contraindications: individual intolerance to the components. During pregnancy and lactation the intake should be under doctor's supervising. In our store You can buy authentic Arthplus GoodCare at the best price!